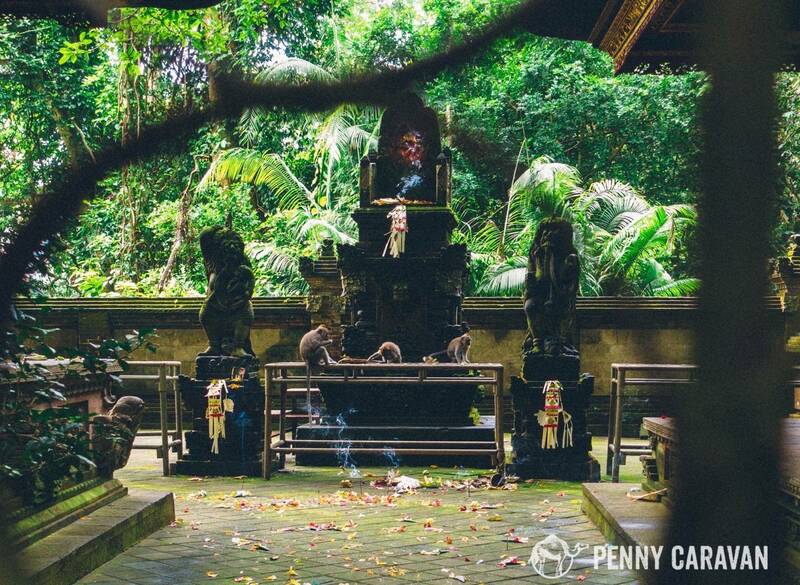 No Ubud itinerary would be complete without a visit to the Sacred Monkey Forest Sanctuary. 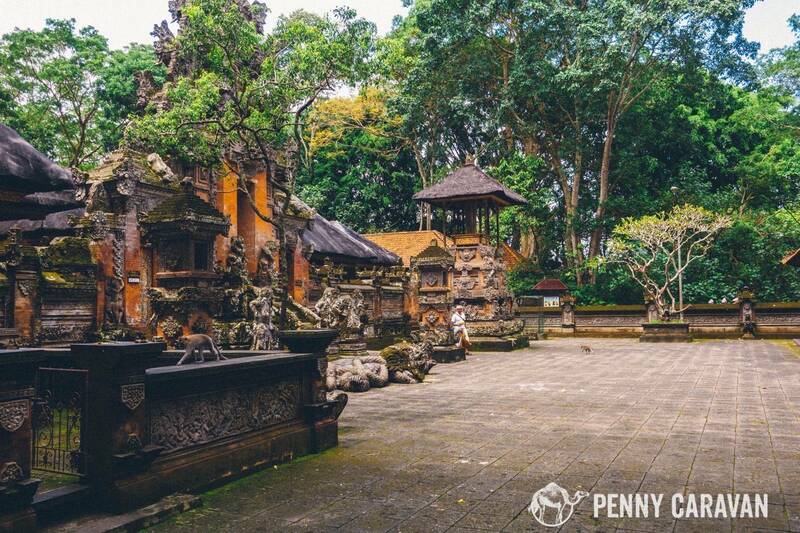 The preserve is home to three Hindu Temples built in the 1300s, and more than 600 Balinese long-tailed monkeys (Crab-eating macaque) who are completely comfortable with human interaction. 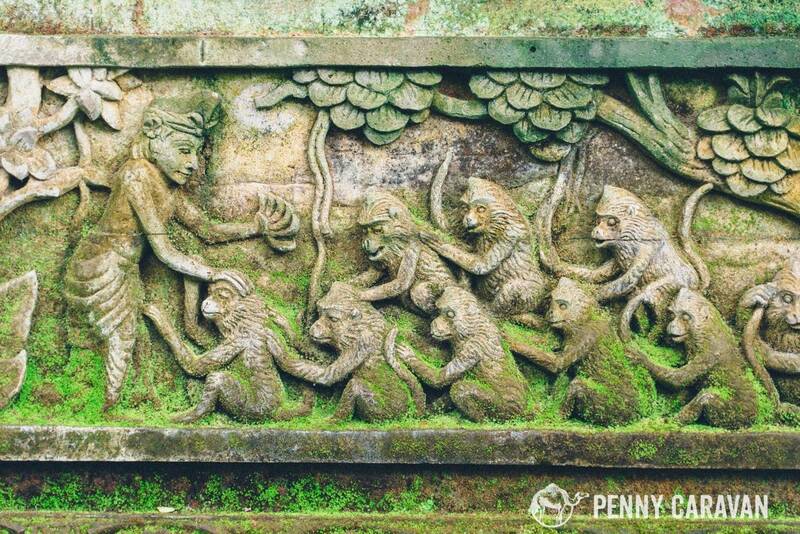 As you can imagine, 600 monkeys climbing over ancient temples makes for some incredible photo opportunities in a Jungle Book kind of way! 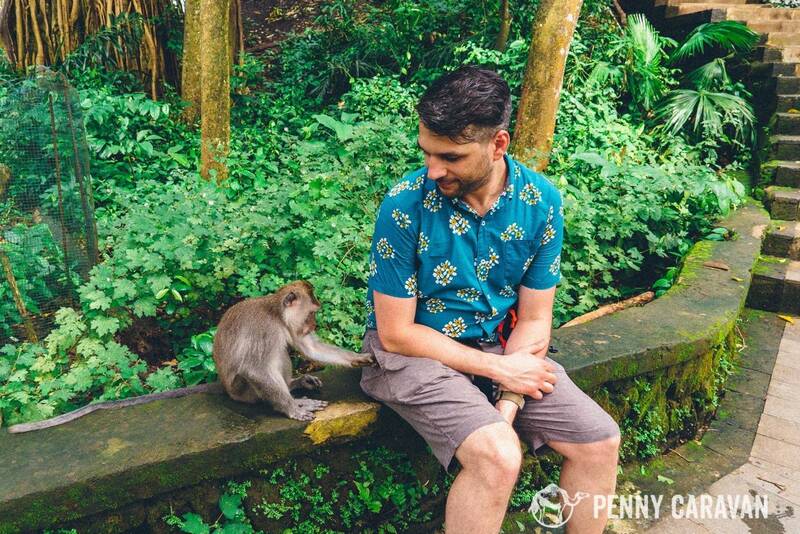 The monkeys are oh so adorable, but we can also tell you from experience that monkey bites hurt. 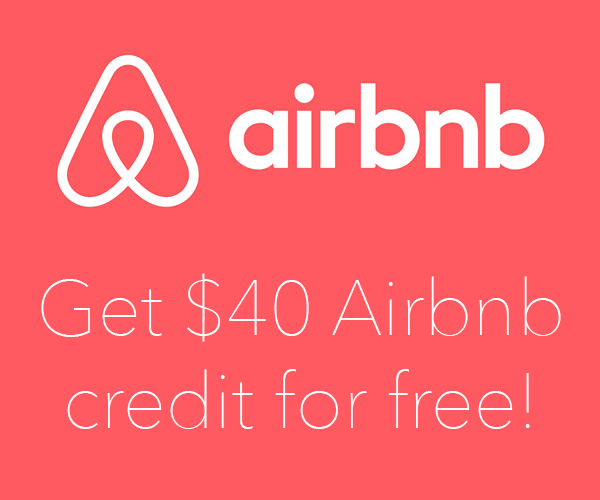 Keep reading and you’ll see what we mean! 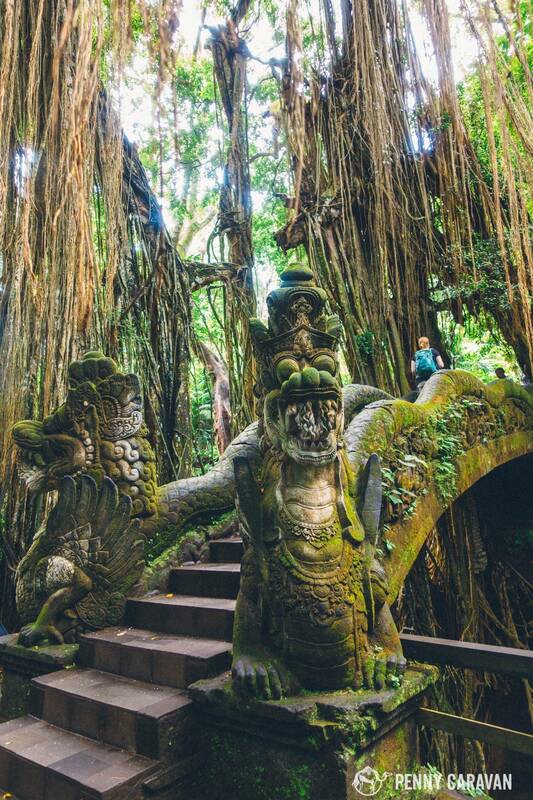 The park is located on the South edge of Ubud just down Monkey Forest Road, making it a convenient add-on to any daily itinerary. 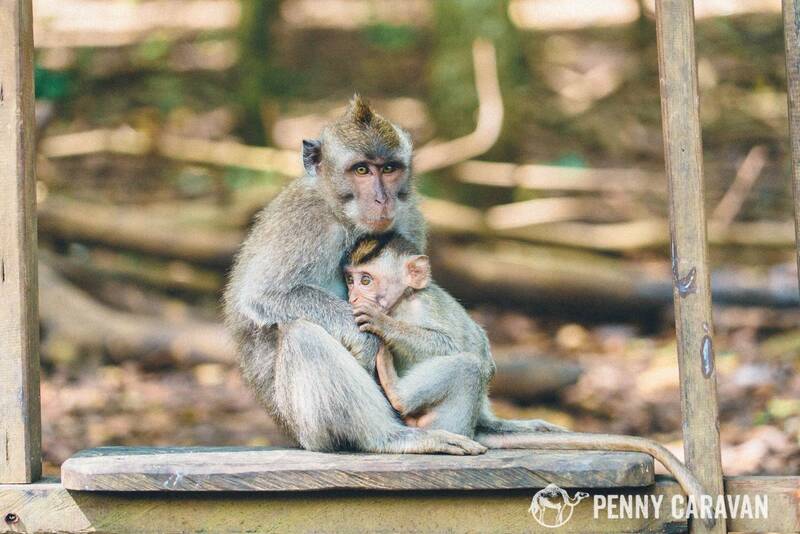 Before you even enter the park, you’ll start to see monkeys along the road and fence. We even saw one in the parking lot sitting on someone’s motorbike. 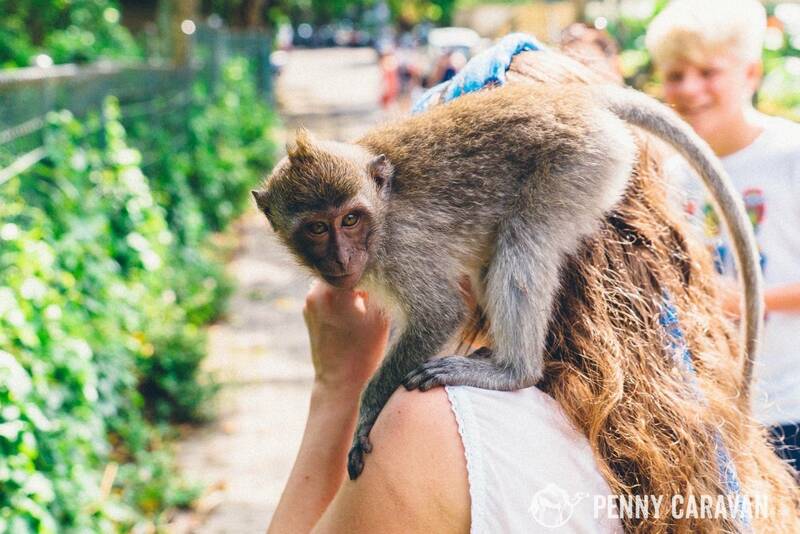 As we walked along the sidewalk, one of the monkeys jumped from the fence onto my shoulders. First sign of a crazy morning to come! Monkeys sitting along the park fence. 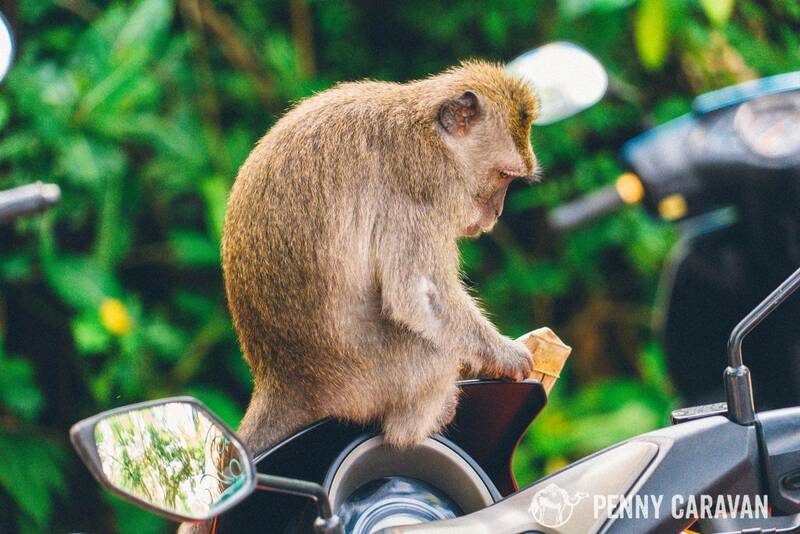 Monkeys on bikes. They’re everywhere! 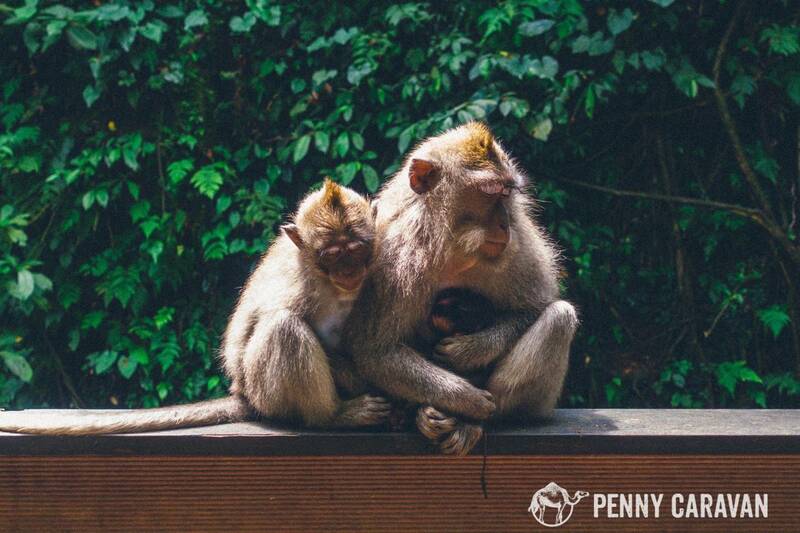 The monkeys roam freely in the park, and you will be getting very close to them whether you like it or not. 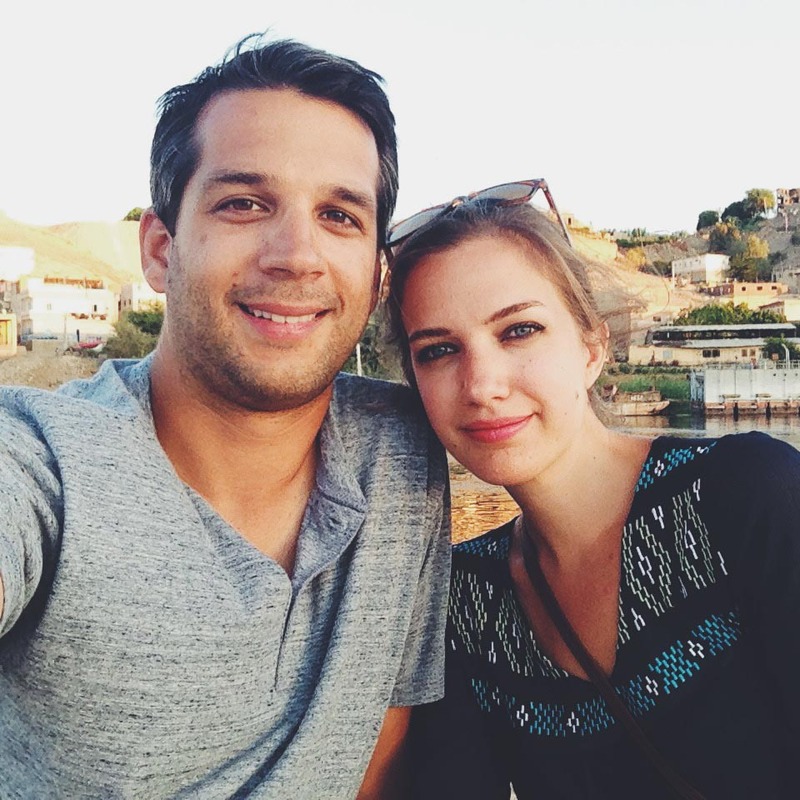 They are used to human interaction as the park receives 10,000 visitors a month! But if a monkey approaches you, it’s only because they want something that you have. They want to reach into your pockets, they will try to unzip your bags, they have even been known to grab water bottles out of people’s hands and yes, they can unscrew the bottle to have a drink! 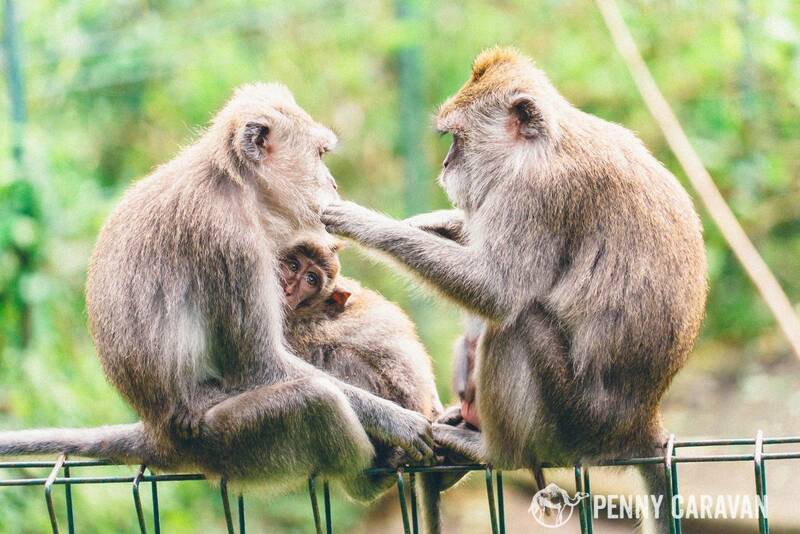 If a monkey has stolen something valuable of yours, do not try to take it back. Find one of the park employees and they will use their tricks to get your belongings back (usually they throw special treats to the monkey so they will drop your valuables). 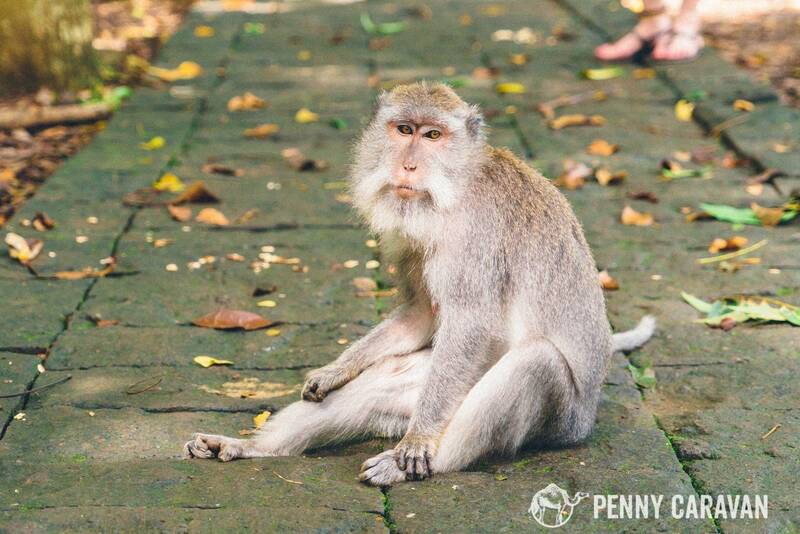 Monkey lounging on the path. 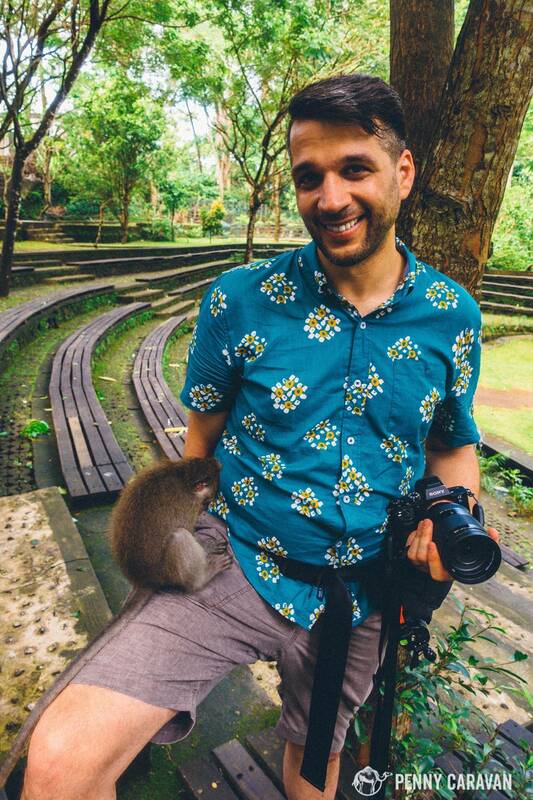 Shane sat down for a rest and a monkey immediately came to him and started reaching in his pockets for the camera lens cap. He then went to the other side and started unzipping the camera bag! Another monkey jumped on him as he was standing to try to get the lens cap in his pocket! 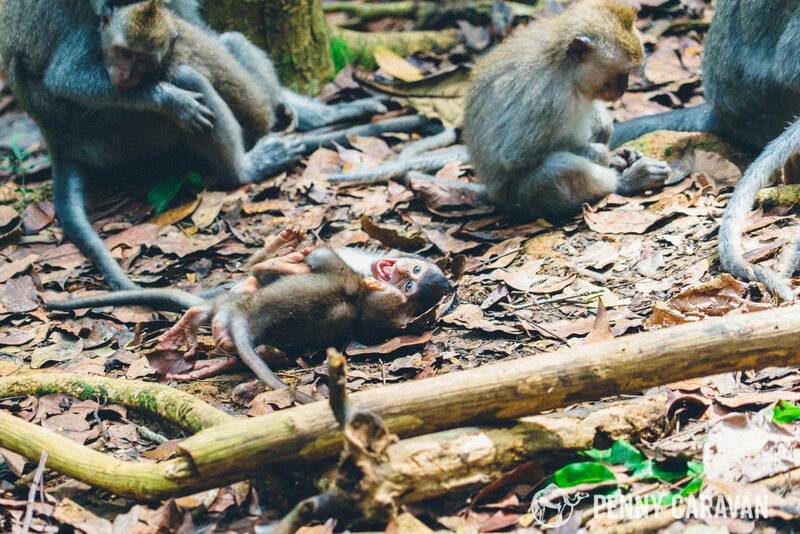 The sweetest scene we saw was this family cuddling a brand new baby. 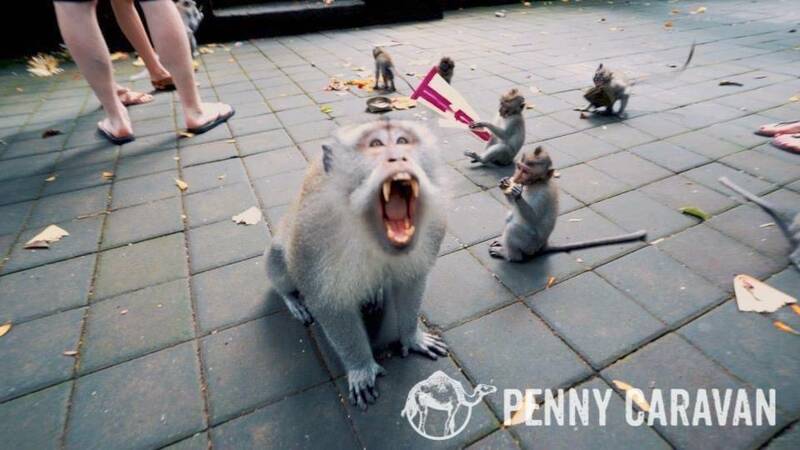 Okay, so those are the cute and friendly monkeys. Now for the aggressive monkeys! We kept seeing the same group of adorable babies running all over the park playing, so a few times Shane stopped to get photos or video of them playing. What we did not notice was the daddy monkey chaperone. This is the group of babies. We did not notice the big daddy at the bottom who was also following them through the park, keeping his eye on his babies. 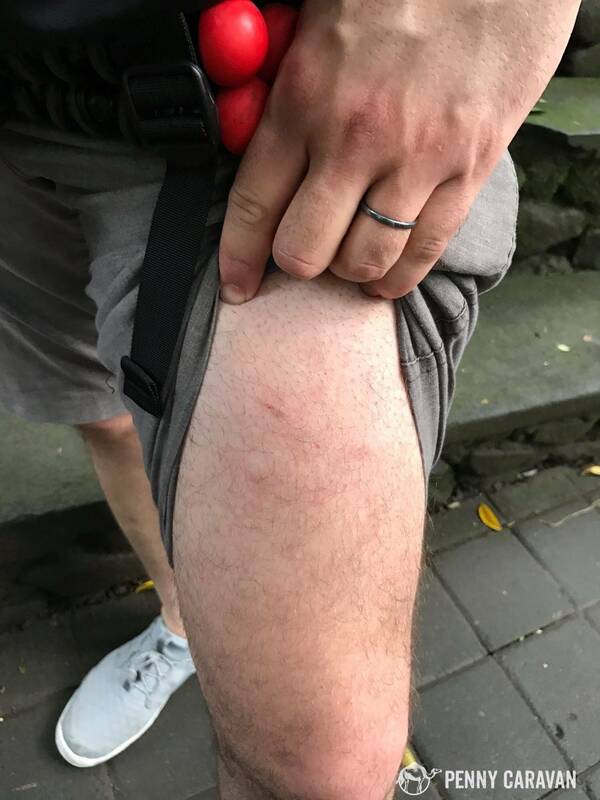 Shane got a little too close to the babies with his camera, and before he knew it the daddy jumped on his leg and bit him through his shorts right on the thigh. He continued baring his teeth at Shane until he backed far away from the babies! Thankfully, the bite didn’t break the skin, but he did have a big bruise on his leg for a few days. Later as we were looking through the videos, we saw that the daddy had given Shane a warning, baring his teeth at him a few minutes before the bite. So after the second offense, he took action! The bite right after it happened. Doesn’t look so bad, but it was bruised for a few days! The daddy bared his teeth at us as a warning. A few minutes later when we again got too close to the babies, he took action and bit! 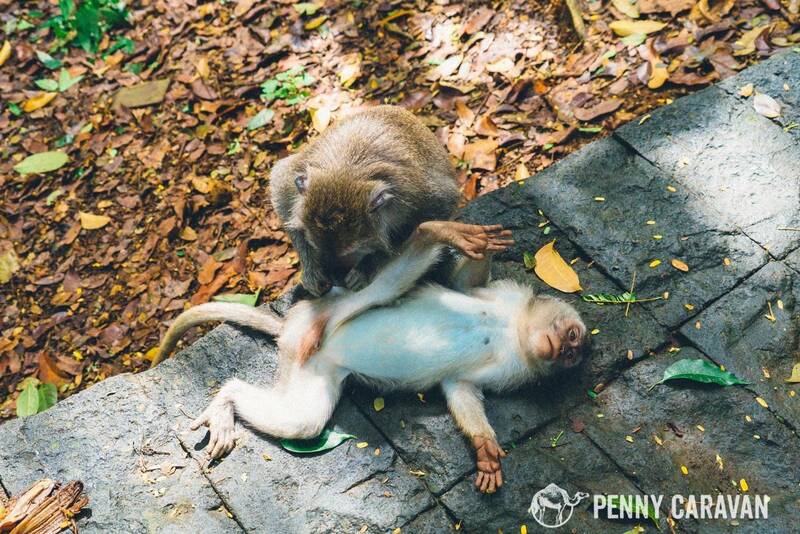 If you do happen to have a bad encounter with a monkey, there is a First Aid Station on site that can assist you. 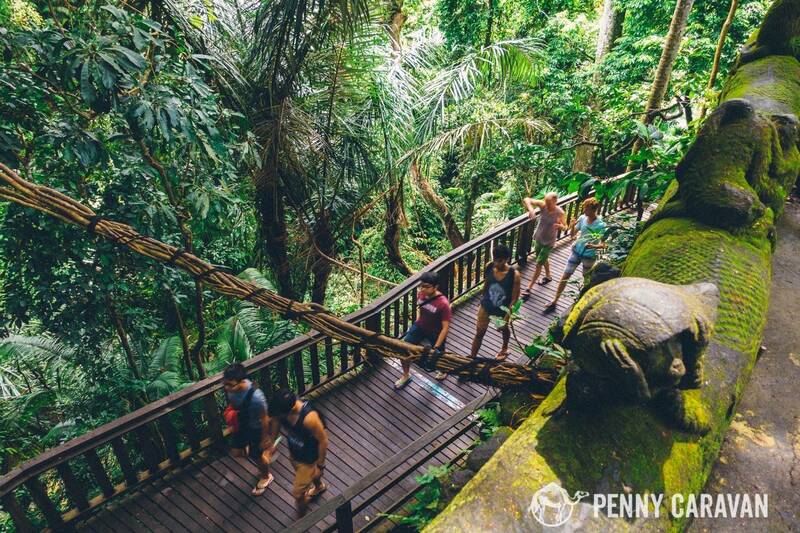 The park is well equipped for visitors with restrooms, paved walkways and bridges through the jungle, and large open courtyards. You will receive a map, which is very helpful to make sure you don’t miss any of the temples, which were established in the 1300s! 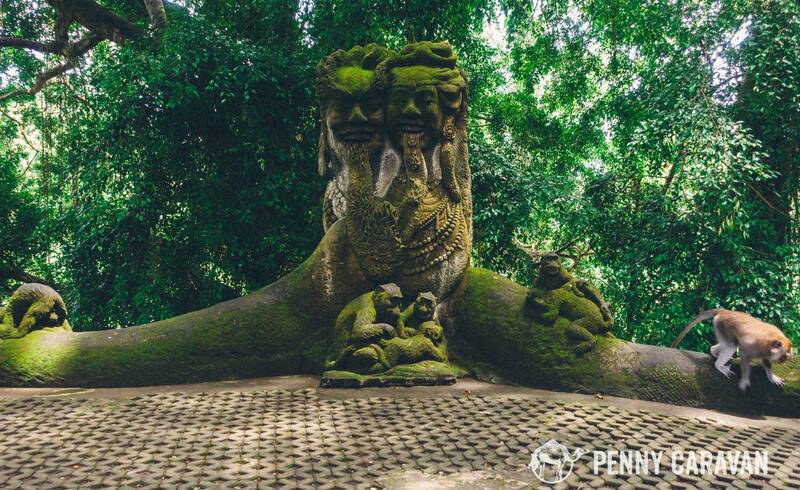 Even if you’re not a monkey person, a visit to the park is a must for the incredible jungle temple scenery. 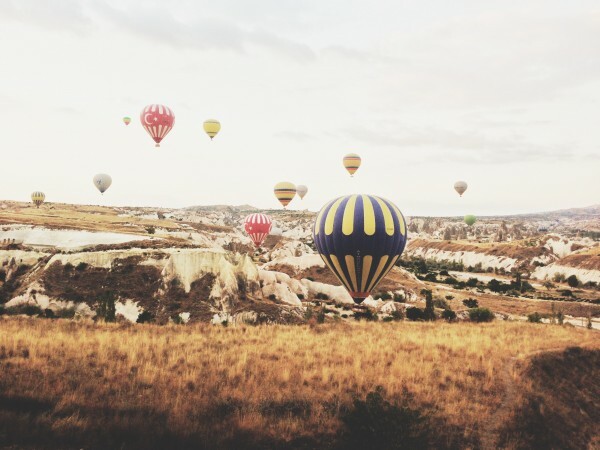 The park receives 10,000 visitors a month! Statues all over the park. A beautiful bridge in the park. Inner courtyard of the main temple. Entry to the temples is for prayer only. 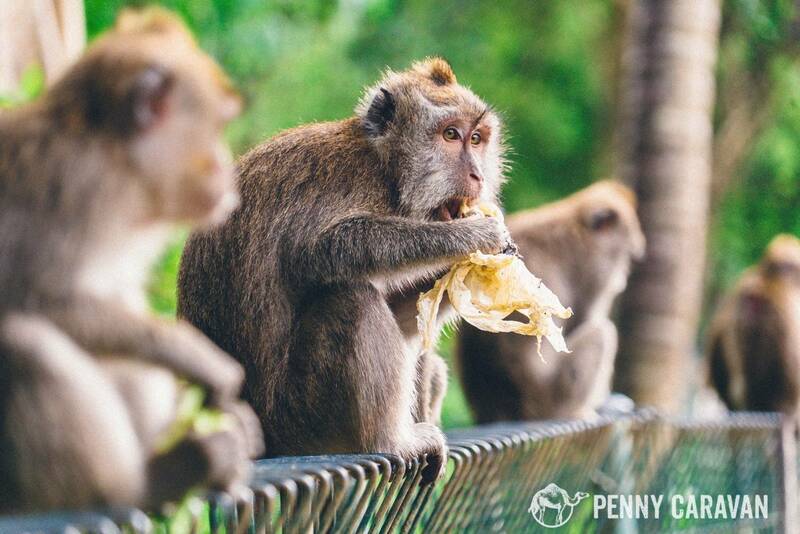 Monkeys making a mess of the food offerings! Despite our eventful visit, we still had a wonderful time at the park interacting with the monkeys in the beautiful jungle setting. 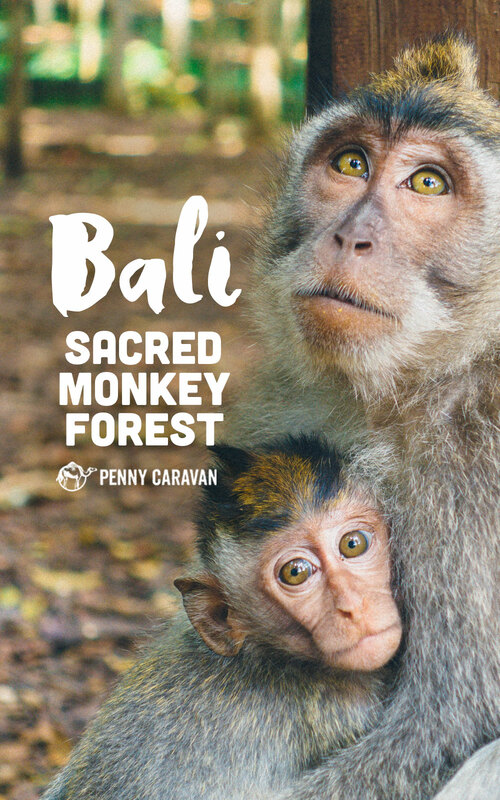 We highly recommend this excursion to anyone visiting Ubud, especially families with children who will be thrilled to see these animals in their natural habitat. 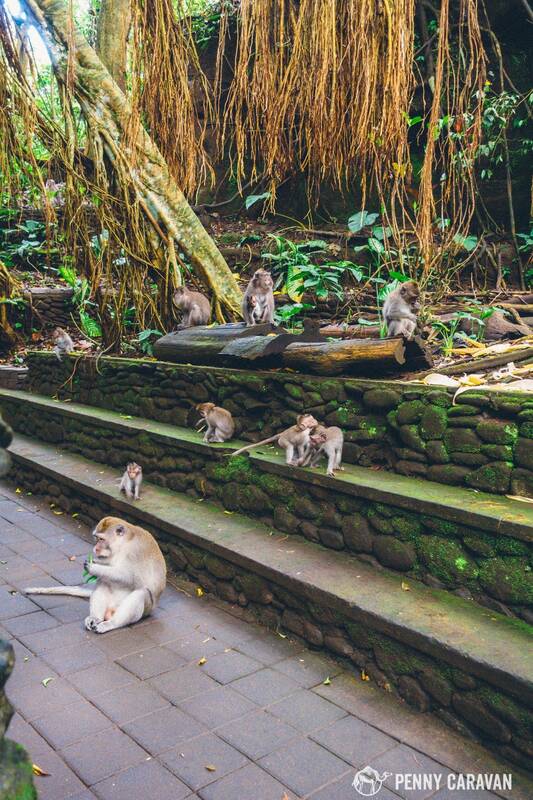 Be careful, follow the guidelines, don’t get too close to the babies, and you’re sure to have a memorable visit to the Monkey Forest!